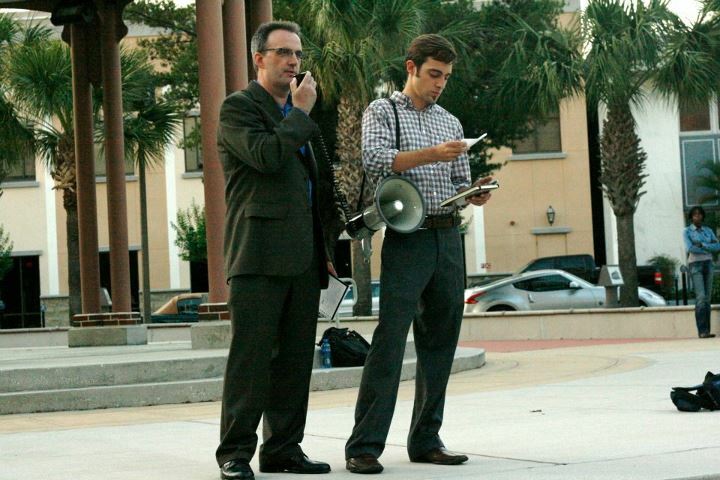 Coalition demands permits to protest Tampa RNC, opposes repressive “Clean Zone” | Fight Back! Tom Burke, of the Committee to Stop FBI Repression, denounces the clean zone at Joe Chillura Park. 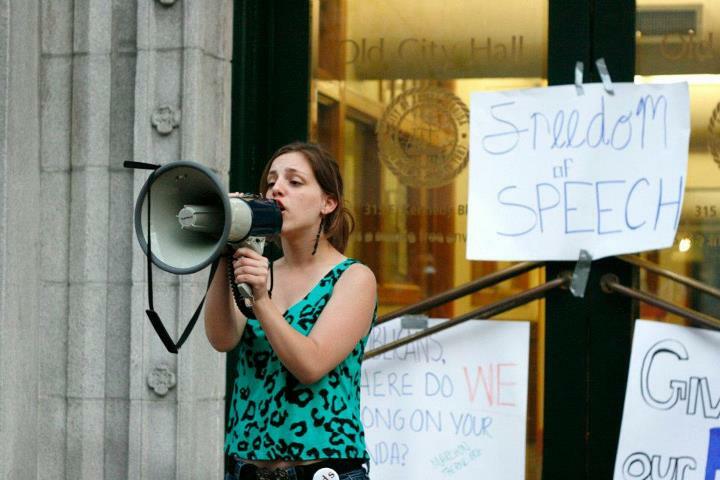 Skye Schmelzer of Students for Democratic Society speaks in front of City Hall. Tampa, FL - Over 30 supporters rallied here, April 10, in Joe Chillura Park to demand permits to march on the Republican National Convention and to slam the “Clean Zone” ordinance. 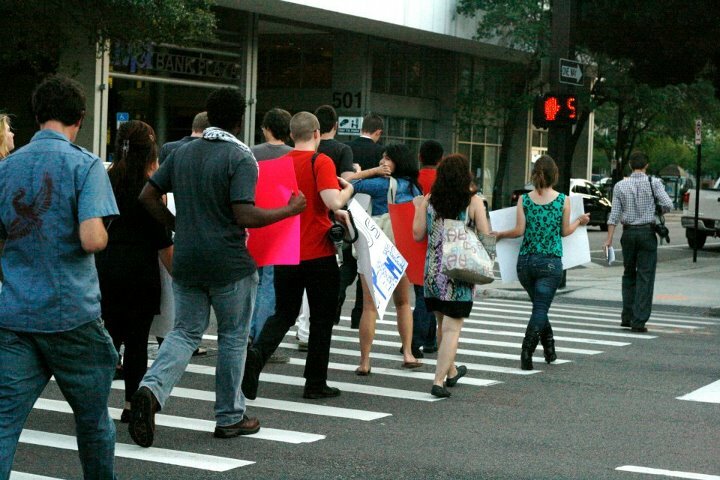 The Clean Zone ordinance proposed by the city government of Tampa would place massive restrictions on any sort of demonstration against the RNC in August. Restrictions include what sort of everyday items protestors could bring to protests and would place any and all actions against the RNC far away from the convention center - effectively silencing any opposition to the Republican agenda of war and poverty. Once the speeches were done, the students, union leaders and community members marched to the steps of City Hall chanting, “Hey hey, what do you say? No RNC in Tampa Bay!” Upon arriving, the protesters duct-taped several signs and posters to the doors of City Hall, denouncing the RNC, demanding permits and condemning the Clean Zone ordinance. 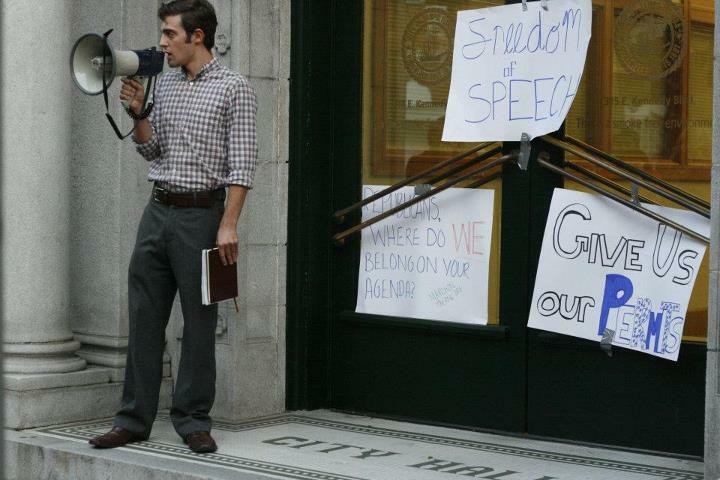 Many young people stood on the steps and made speeches denouncing the Republican Party, the Tea Party and Wall Street. The Coalition to March on the RNC will hold their second national call-in day opposing the repressive “Clean Zone” ordinance of Tampa Mayor Buckhorn on Wednesday, April 18. For more information go to http://www.marchonthernc.com/.